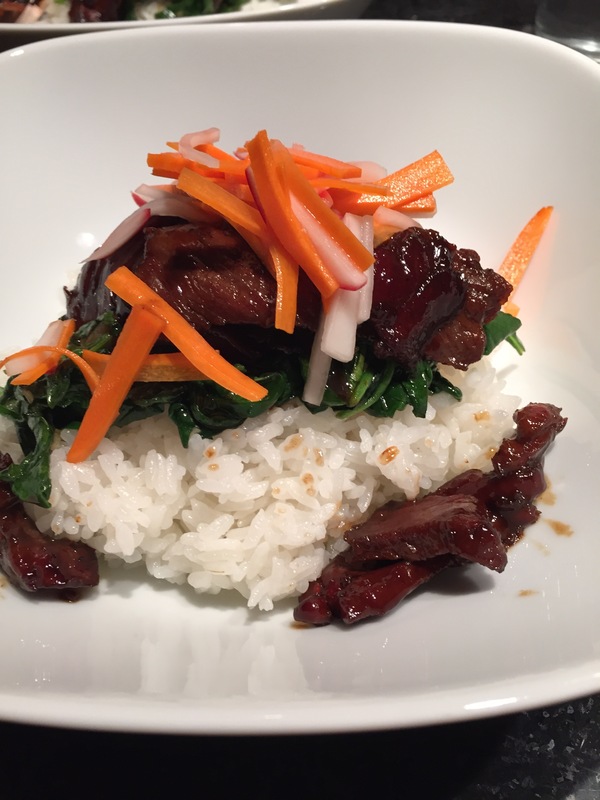 I hate to say this – but airplane food inspired this recipe. I’ve been traveling for work the last 2 weeks, pretty much cross-country – and on my flight from San Francisco to Chicago, the flight had a Korean rice bowl entrée. It wasn’t bad for being airplane food. It was bulgogi – Korean barbecue beef and bibimbap – Korean rice bowl. Here is my version of the dish. Place the radishes, carrots and seasoned rice vinegar in a bowl. Allow the vegetables to marinate for at least 30 minutes, but less than 4 hours. I like my vegetables crunchy, so I let it sit for just under an hour. Preheat the oven to 200° F. Place the steak in a large baking dish and sprinkle brown sugar on both sides. In a medium size bowl, combine the brown sugar, soy sauce, sesame oil, sake, and garlic. Pour the marinade on the steak, mix thoroughly and let sit for 20-30 minutes. The steak pieces are cut thin so it won’t take long for the flavors to meld. Prepare the rice – granted, I only know how to make rice in a rice cooker and it’s relatively easy to use. I wouldn’t know how to make rice any other way. In a large non-stick pan, heat oil in medium-high heat. As the oil starts to shimmer and just before it starts to smoke, cook all the steak thoroughly. I always add the marinade as well. Once cooked, place all the content of the pan on a baking sheet and place in the oven. In the same (and now empty and wiped) pan, heat oil in medium-high heat until it starts to shimmer. Add the garlic and stir until fragrant. Add the spinach and cook until wilted. Place a cup of rice in each bowl. Add the spinach. Add the beef. Add the vegetables. Classic bibimbap has bean sprouts and cucumber in the pickled vegetables. I opted for radishes instead as my hubby doesn’t like sprouts; and cucumbers – if marinated too long – lose their crunchiness. Add shiitake mushrooms to the recipe, cook them along with the steak. Add a friend egg on top of the vegetables.